Statins are one of the most frequently prescribed medicines in New Zealand each year. Alongside lifestyle modifications, statins are the mainstay of lipid management. New Zealand and international guidelines recommend statins for the primary prevention of cardiovascular disease. Statins are one of the most frequently prescribed medicines in New Zealand each year (Table 1). Alongside lifestyle modifications, statins are the mainstay of lipid management. New Zealand and international guidelines recommend statins for the primary prevention of cardiovascular disease. Liver dysfunction and muscle problems such as pain (myalgia) and weakness can be experienced by up to 10% of patients taking statins. However, myalgia is commonly experienced by all people at some stage in their life, regardless of statin use. Risk factors for statin-associated myalgia include pre-existing muscle, liver or kidney disease, high-dose statin treatment, concomitant interacting medicines, intercurrent illness, frailty and advanced age. It is no longer considered necessary to routinely monitor liver (alanine aminotransferase [ALT]) and muscle (creatine kinase [CK]) biochemistry unless the patient has specific risk factors or develops symptoms or signs of liver dysfunction or muscle problems. When should lipid-modifying treatment be stopped or the dose reduced? Statins are commonly used medicines in New Zealand, with approximately 16% of the adult population (≥18 years of age) dispensed a statin in the last 12 months (Table 1). Baseline testing of muscle enzymes prior to statin treatment is unnecessary unless the patient has risk factors. Once treatment has started, monitoring of alanine aminotransferase (ALT) or creatine kinase (CK) is unnecessary unless clinically indicated i.e. the patient is symptomatic or has specific risk factors. 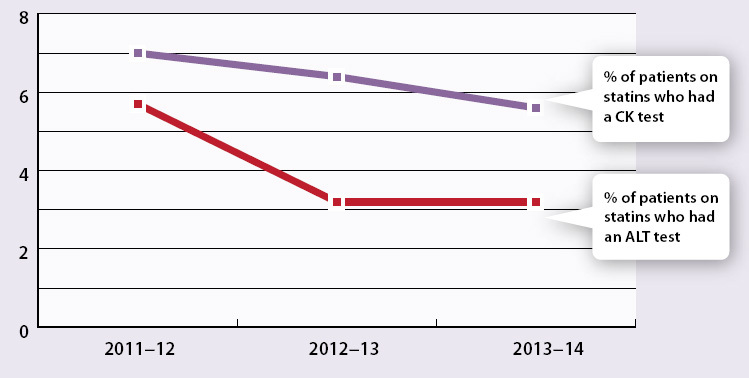 Figure 1 below shows that nationally these guidelines are being followed with a reduction in testing over the last three years. 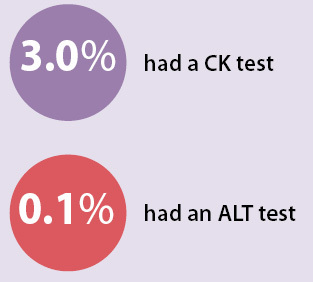 Between Jul 2013 – Jun 2014, 5.5% of patients dispensed a statin had a CK test and 3% an ALT test. 1. Best Tests, August 2014. Available at www.bpac.org.nz (Accessed Oct, 2014). 2. New Zealand Formulary 2014. Available at www.nzf.org.nz/nzf_1618 (Accessed Oct, 2014). Lyn Olds said: 26/11/2014 8:57:17 a.m. Huge number of pts requiring this medication. How long before the change in diet and lifestyle can make a real difference? Jo Musson said: 17/05/2016 6:04:16 p.m. The Editor said: 27/05/2016 2:40:29 p.m.
Statins competitively inhibit HMG CoA reductase, an enzyme involved in cholesterol synthesis. However, statins may have other pleiotropic effects that result in the stabilisation of atherosclerotic plaques. It is currently unclear to what extent any possible differences in mechanism contribute to the clinical benefit that patients gain from taking statins.